Terminology: "back of the eye, front of the eye, angiography, arteriosclerosis, computed tomography, diabetes mellitus, edema, ileus, macula, macular degeneration, ophthalmoscopy, papilledema, presbyopia, retina, retinitis pigmentosa, retinopathy, sclerosis.". See also microplasmin. The vitreoretinal specialities address "Back of the Eye" diseases and treatments (including surgery). Vison correction and cataracts are examples of "front of the eye" disorders. 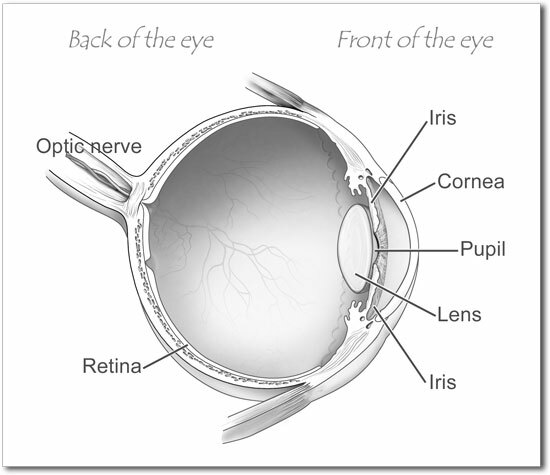 Back of the Eye disorders include macular degeneration, retinal tears and detached retinas, among many others. Vitreoretinal specialists include retinal surgeons, retinal specialists, and some ophthamologists diagnosing and treating macular and retinal disorders, and working for early detection and prevention of vitreo-retinal disorders. Access resources via the menu on the left, and an excellent gateway to Back of the Eye disease at nlm.nih.gov/medlineplus/eyediseases.html. To add, remove, or correct materials posted to this web site, please send email to info at this website, and we will respond promptly. The content provided within vitreoretinal.org web site is for informational purposes only. It should not be used as a substitute for professional medical advice. The information is provided without warranty of any kind, expressed or implied, and use of the information is strictly voluntary at user's sole risk. Last updated 5/3/2010.